When we first became interested in growing and using dye plants we came across an entry in “Traditional Scottish Dyes and how to make them” by Jean Fraser. This seemed to us to be very exciting because it offered a tantalising alternative blue dye to Woad indigo. Page 69 from Jean Frasers book – Traditional Scottish Dyes and how to make them. 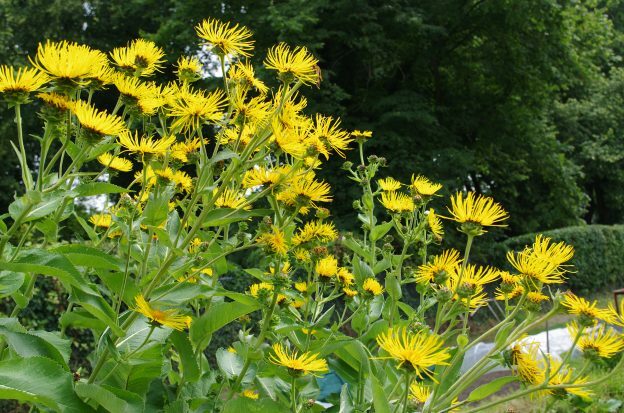 We immediately set about obtaining some seeds which were readily available as Elecampane is a popular garden flower and ancient medicinal herb. Our first lot of seedlings were all eaten by slugs but the second batch (protected until they were larger) survived to produce two small beds. It took a number of years for the plants to reach full size but by this time we had realised that the likelihood of obtaining blue from the roots was very unlikely and we had discovered Japanese Indigo so did not think it worth even trying. We kept the plants because every year we are rewarded with a sunny display of glorious yellow flowers which act as magnets for bees of all kinds. These tall plants with giant leaves are low maintenance and just take care of themselves. Honey bee on Elecampane flower. The Dye garden has grown over the years and we are getting to the point that every plant species we grow has to justify its presence by being a proven source of plant dye. But still, the mystery of Jean Fraser’s entry stuck in our minds so this year I decided to give it a go before the plants started to grow. 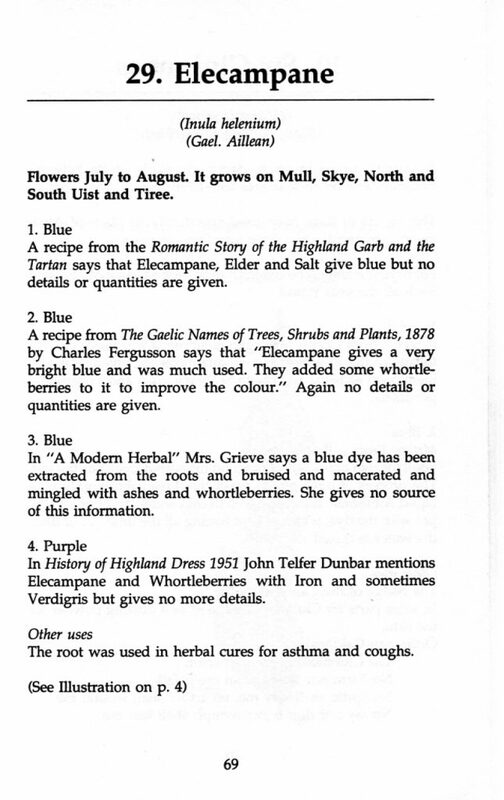 Three of the incomplete “no details or quantities given” recipes mention whortleberries and one recipe Elder (presumably berries) as additives to improve the colour. We know by now that most black berries can give pinks, lilacs and mauves with a good alum mordant but they are not lightfast, iron mordants are best at prolonging the life of fugitive dyes and the fourth recipe mentions iron so we thought it worth obtaining some whortleberries . What are whortleberries? All three plants grow commonly in Scotland but we think it is a reasonable guess that the name refers to the bilberry V. myrtillis or uliginosum as vitis-idaea is a red berry. The closest source of berries we could get hold of were supermarket blueberries (probably Vaccinium corymbosum). Not as good as our native bilberries as they only have a blue black skin and internal pale green flesh. Our native species are blue/black throughout. Samples of unmordanted, alum mordanted and iron mordanted wool were added to each of the dye pots (the root and berry material were not removed). The roots of elecampane are white with a yellowish skin and black bark which is not attached to the root and is easily washed off. There appears to be no colour in the root at all! Because of this lack of colour we had long suspected that the only possible source of colour would be from tannins in the root reacting with the iron mordant to give a grey. We suspected that in Scotland grey was often called blue and with the addition of some whortleberries a bluish grey could be obtained though it would fade to grey over time. 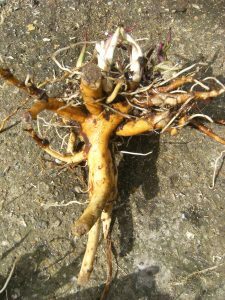 As there are many other sources of tannin in the dye plant world we were sceptical that Elecampane root would give us anything worth having. The results were fairly conclusive in that the only significant colour change occurred with the iron mordanted wool where a silvery grey was obtained from the fresh root and a yellowish grey from the fermented root. The unmordanted wool stayed white and the alum mordanted wool turned a very pale yellow. The addition of blueberries made little difference. 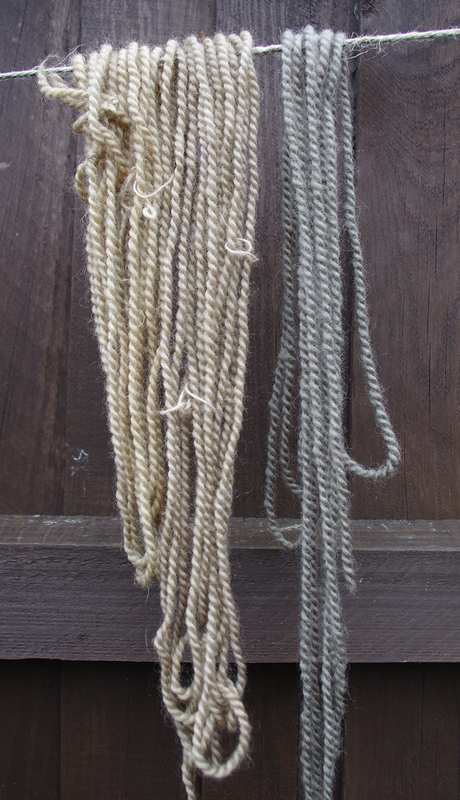 Right: iron mordanted wool in fresh root dye bath. Left: Iron mordanted wool in fermented root dye bath. On the left cut root treated with iron mordant. 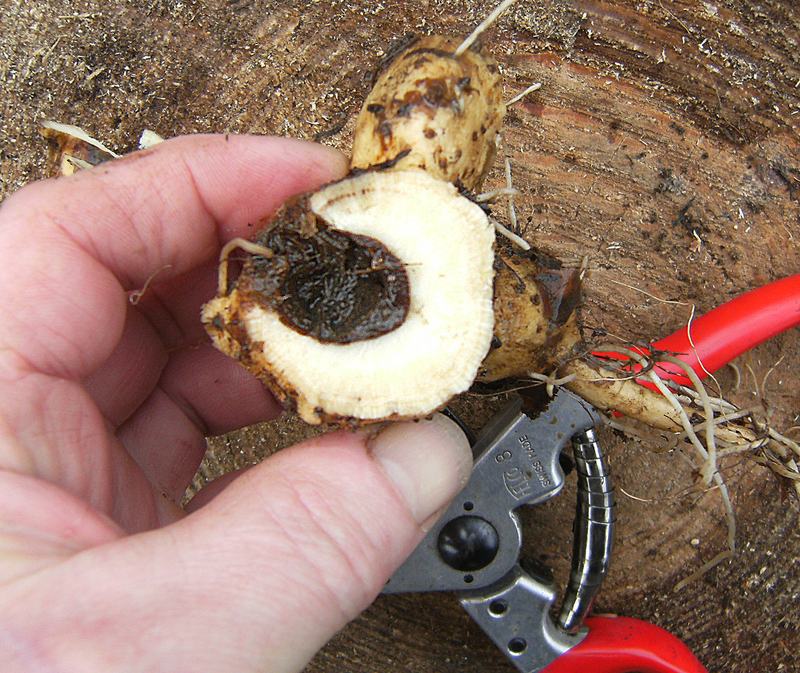 On the right untreated root. Painting an iron mordant solution onto cut plant material usually shows up the presence of tannins fairly rapidly but sometimes it takes a few hours to get a colour change. 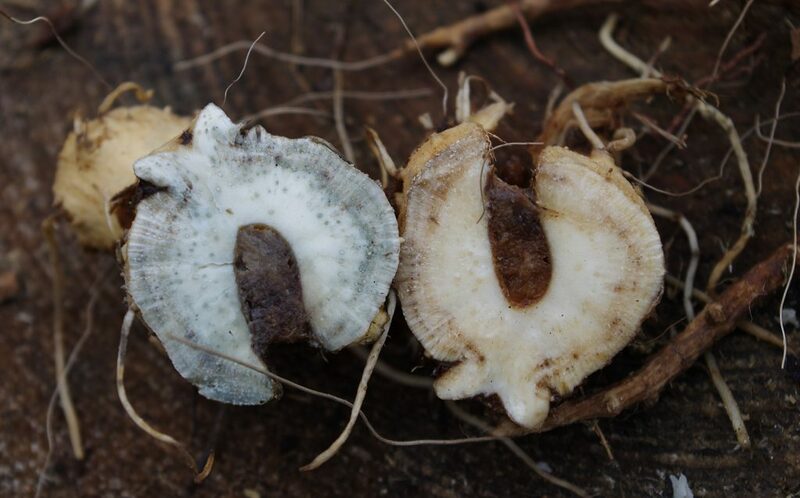 The elecampane root had to be left overnight before the change seen here on the left took place. Other additives mentioned in the recipes are salt and ash. Dipping a cut root in salt had no effect but adding a tiny amount of sodium hydroxide (an alkali in wood ash [lye]) to the cut root turned it immediately yellow and after 24 hours a yellowish dark grey. We did not use any of this alkali in our experiments as we were particularly interested in obtaining a neutral or blue grey but it looks like adding the alkali could aid in getting a darker colour. 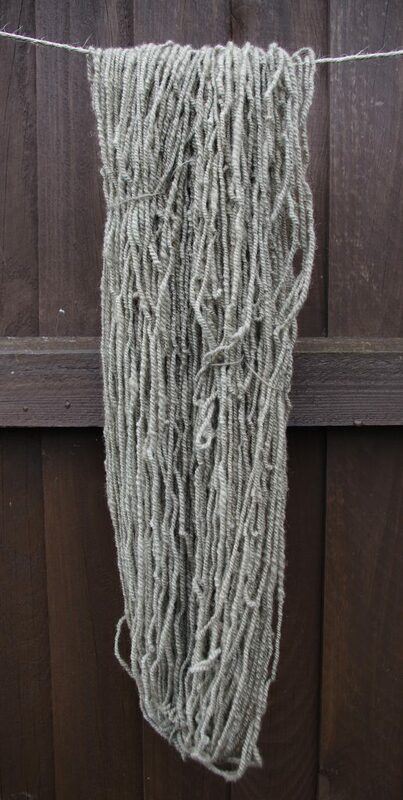 Once we were happy we could get this neutral grey we went ahead with dyeing a large skein of hand spun yarn (about 100g) mordanted with 1g of ferrous sulphate*. This was added to a dye bath made from about half a kilo of chopped and bruised Elecampane root heated to around 90°C and left for one hour then strained to remove the solids. 100g skein of hand spun iron mordanted wool dyed with Elecampane root. OK, so no blue, but a good neutral grey is hard to obtain as most tannin rich plants have additional dye stuffs and the greys obtained are tinted with yellows or browns. 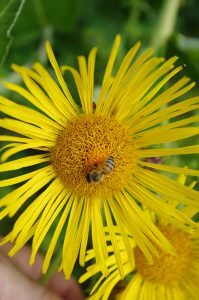 Elecampane is almost free of any of these contaminants. As any designer will verify grey has the ability of amplifying adjoining colours making them seem brighter than they really are. A dye garden without a source of grey would not be complete so the Elecampane stays! *The iron mordanting is done according to Liles method using the same quantity of oxalic acid as ferrous sulphate. The Oxalic acid prevents the iron from oxidising from the yellow-green ferrous sulphate to orange ferric oxide (rust). 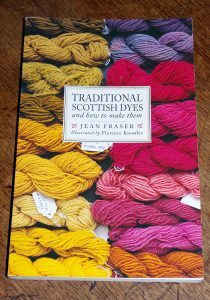 “Traditional Scottish Dyes and how to Make them” by Jean Fraser. Illustrated by Florence Knowles. © 1983, 85 and 96. 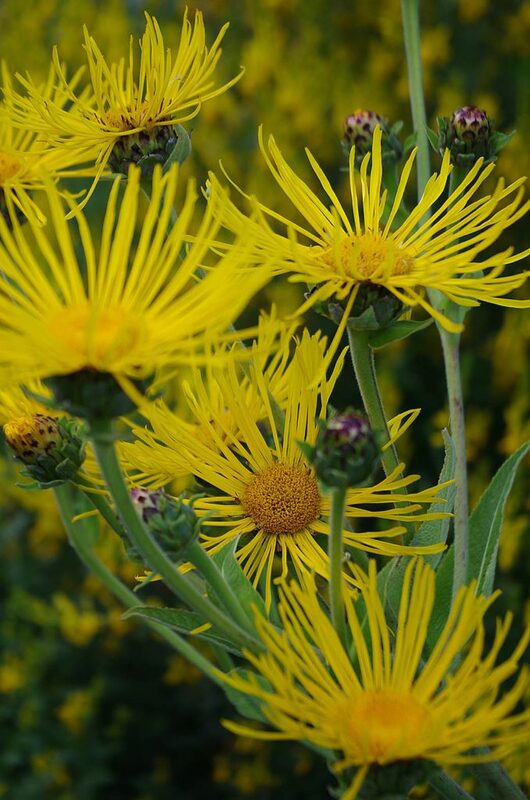 This entry was posted in Ashley's posts, Elecampane, growing dye plants, learning to use dye plants and tagged Elecampane, Growing dye plants, Inula helenium, Natural dyeing, Tannin and iron on 31st March 2018 by susan dye.